Would you like to help your sales team to perform better? 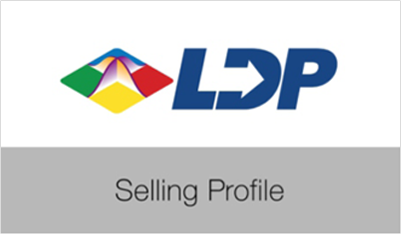 The Selling Profile provides a coaching tool that describes each person's natural tendencies at each stage of the sales cycle. To improve performance immediately, focus on the parts of the Potential Strengths. To improve performance over time, focus on the Development Points. 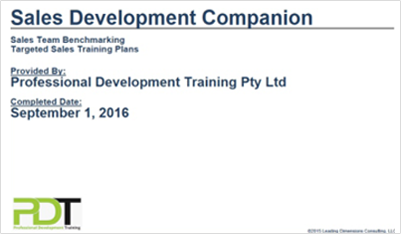 The Sales Development Companion clearly shows the natural strengths of your team overall and as individuals. To improve performance immediately, specialise your team members into each person's natural strengths, even consider peer-to-peer coaching. 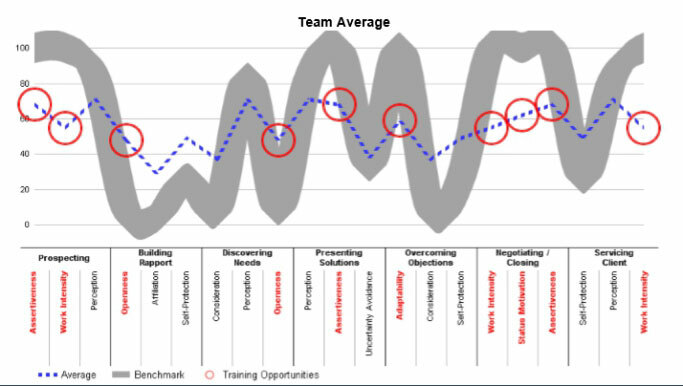 To improve performance over time, focus on the Development Points for individuals or the team overall with targeted training and recruitment to fill gaps. When using this tool for coaching, it's amazing to watch the seasoned skeptical "I've seen it all before" sales professionals end up saying "I'm surprised, I agree with just about all of it!" Buy one at a time, purchase packs, or for remarkable value, subscribe for unlimited use! See how closely they match your ideal candidate in a one page snapshot? Know how closely your applicant matches the profile of the world's highest-performing sales people? Create a scorecard for your own company's unique ideal sales professional - and recruit to that? 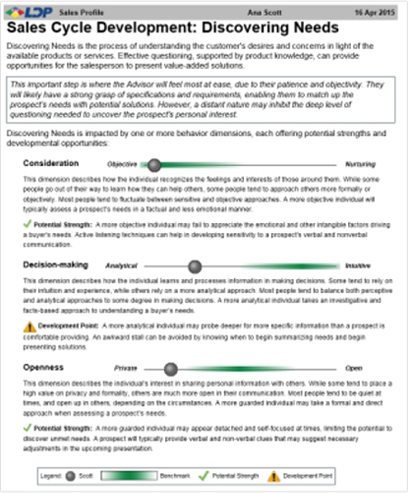 The Position Profile provides all of that in a simple, visual, one page report. This is the perfect recruitment and selection aid - backed up by research and statistics globally. Start today - save your time, achieve better results, it's amazingly cost effective. Customisable survey, ask other pre screening questions in the single survey "Do you have a current, valid drivers licence?" A pre-existing range of validated surveys e.g. How closely does the applicant match the profile of the highest performing GM's? 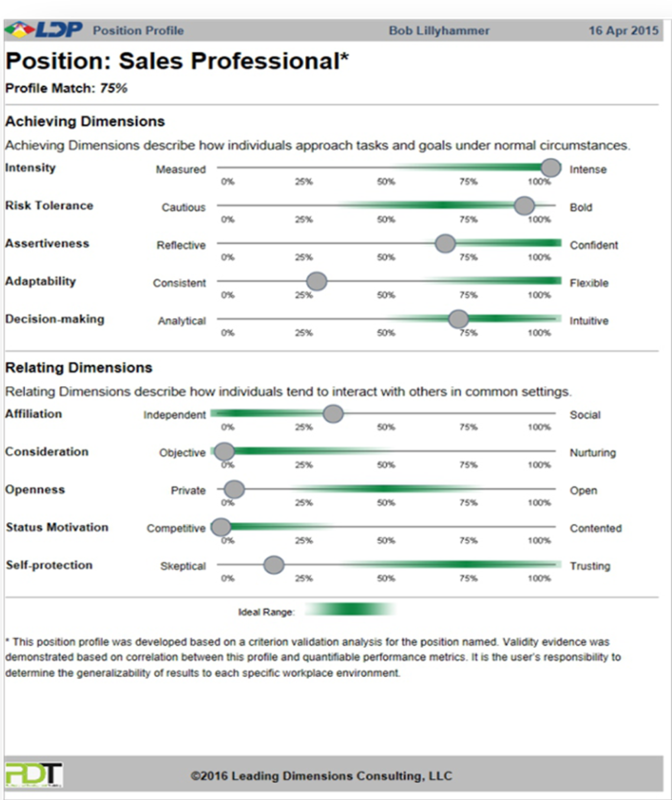 Specialised Sales Profile - does the applicant match the personality DNA of the highest-performing sales people? Does this applicant match the profile of my other high-performing people? Does this applicant match the profiles of my other high-performing people?